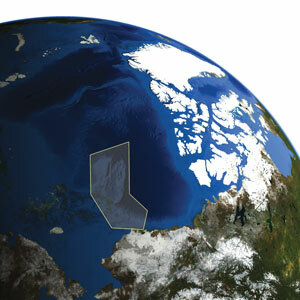 The area north of Alaska that researchers surveyed last summer is highlighted. More than six months after Russia staked its claim to much of the North Pole by planting its flag on the Arctic seafloor, the United States has new evidence that could help extend its own Arctic boundaries. Seafloor topography suggests that the foot of the continental slope off northern Alaska is more than 185 kilometers farther from the U.S. coastline than previously thought. This finding could help the United States gain more control over the Arctic, including its deeply buried oil and gas reserves. Last summer, researchers from NOAA and the Joint Hydrographic Center at the University of New Hampshire in Durham spent a month surveying 10,000 kilometers of the Chukchi Cap ridge in the Arctic to create the most detailed, high-resolution maps of the area to date. The expedition’s seafloor data and maps are now available online at www.ccom.unh.edu. These data could be important if the United States ratifies the U.N. Convention of the Law of the Sea, which stipulates that a country has sovereignty over marine areas within about 370 kilometers of its coasts. But a country can try to expand its territory if it has geological proof that its continental shelf extends beyond that limit — something that the new data could help prove.